You can offer a nesting shelf to attract American Robins. A nesting shelf for robins and phoebes. 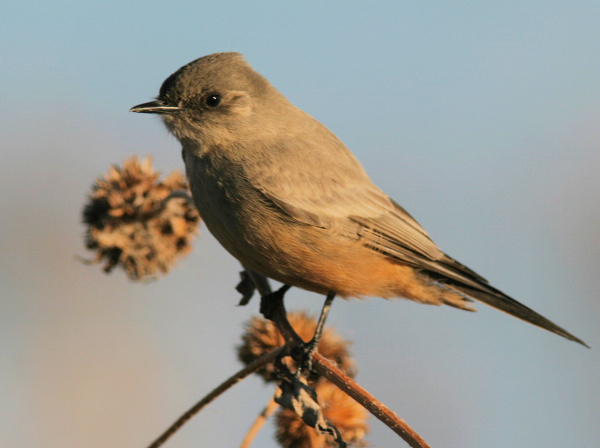 Nesting Say’s Phoebes can be attracted in the western states. 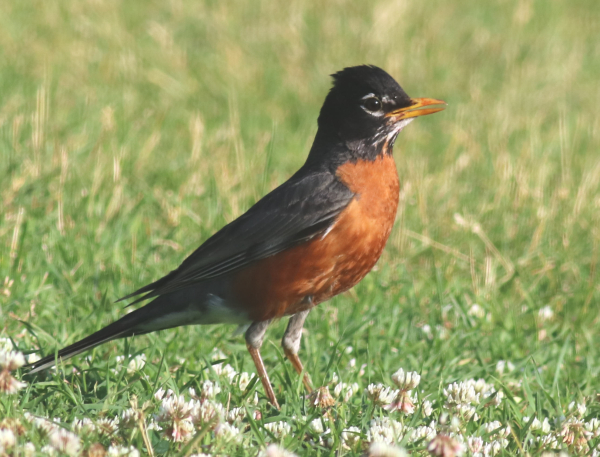 Among America’s favorite birds, robins rank high, and many people wish to attract them to nest in their yards. Although American Robins do not use bird houses (they are not cavity nesting birds) you can attract them by providing a nesting shelf. The same nesting shelf may also attract nesting phoebes, specialized flycatchers that are also popular birds. Depending on your location, you may attract an Eastern Phoebe in the eastern half of the country, Say’s Phoebes in the western half of the continent, or Black Phoebes in the far west. A nesting shelf is essentially a simplified open nest box with the front open along with parts of the sides. 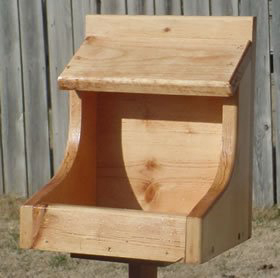 The shelf extends about 7 inches outward and provides a base for robins or phoebes to build their nest on top. Nesting shelves should have a slanted roof to repel rain, and drain holes should be drilled into the bottom corners of the nesting shelf so rainwater doesn’t pool in the bottom. The sides only extend 3 to 4 ½ inches to provide a level of side protection from the sun, rain, wind, and the view of predators. Install your nesting shelf under a building eave or soffit for shelter – perhaps on your garage or porch. For robins, it is suggested to position the nesting shelf 5 to 25 feet high. Phoebes prefer lower shelf elevations – Eastern Phoebes prefer 3 to 15 feet high and Say’s Phoebes 4 to 9 feet high. So overall, if you wish to attract any of these birds, position your nesting shelf between 5 and 9 feet high. If, perhaps, you would prefer to limit your shelf to nesting robins, try positioning it between 20 and 25 feet high, above the preferred height of phoebes. Phoebes also prefer the nest shelf to be positioned close under an overhead ledge or eave. Phoebes also prefer sites with fresh water nearby (a water feature). One more thing: Remove the old nest from the nesting shelf after nestlings fledge (or if a nesting attempt fails), so pairs may re-nest in the nesting shelf.